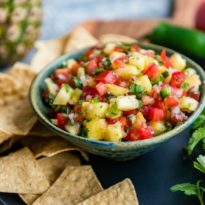 An easy recipe for Pineapple Salsa. Loaded with plenty of fresh pineapple, tomatoes, red onion, jalapeños, and cilantro, this is your answer to spring and summer snacking! It's perfect with chips or on your favorite grilled meat, and it's good for you! In a large bowl, combine pineapple, tomatoes, cilantro, red onion, and jalapenos. Add lime juice and toss to coat. Season to taste with salt, pepper, and hot pepper sauce, if using. Allow flavors to blend at room temperature for 30 minutes, or chill until serving time. Serve with tortilla chips.